Davis: Dear Champion Vending Company: I put five quarters in your machine and proceeded to push B2, which should have given me peanut M&M's. Regrettably, it did not. I found this upsetting, as I was very hungry, and also my wife had died ten minutes earlier. I was pleasantly surprised by this movie. Opens with a car crash that takes the life of Jake Gyllenhaal's character's wife. From there this movie swung in a different direction than I thought. For me it seems to be about how someone deals with grief. Everyone around his character wants/expects him to be acting in a certain way. His wife's death has changed his outlook on life and those around him eventually become less comfortable with his behaviour. I really enjoyed Jake's performance. His character is weird (Not Nightcrawler weird), funny, angry and ultimately just figuring out how to grieve. For a movie I was expecting to lean into the sentimentality it played out in a different way that I feel is a bit more true to real life. 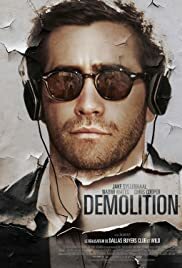 It didn't win him any awards but I think the acting in this places it as one of the better movies Jake has done.